To generate meaningful information, translational research must employ paradigms that allow extrapolation from animal models to humans. However, few studies have evaluated translational paradigms on the basis of defined validation criteria. We outline three criteria for validating translational paradigms. 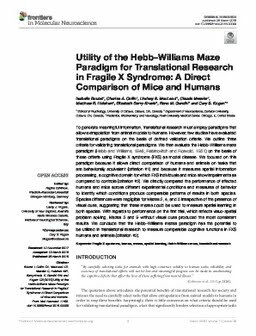 We then evaluate the Hebb–Williams maze paradigm (Hebb and Williams, 1946; Rabinovitch and Rosvold, 1951) on the basis of these criteria using Fragile X syndrome (FXS) as model disease. We focused on this paradigm because it allows direct comparison of humans and animals on tasks that are behaviorally equivalent (criterion #1) and because it measures spatial information processing, a cognitive domain for which FXS individuals and mice show impairments as compared to controls (criterion #2). We directly compared the performance of affected humans and mice across different experimental conditions and measures of behavior to identify which conditions produce comparable patterns of results in both species. Species differences were negligible for Mazes 2, 4, and 5 irrespective of the presence of visual cues, suggesting that these mazes could be used to measure spatial learning in both species. With regards to performance on the first trial, which reflects visuo-spatial problem solving, Mazes 5 and 9 without visual cues produced the most consistent results. We conclude that the Hebb–Williams mazes paradigm has the potential to be utilized in translational research to measure comparable cognitive functions in FXS humans and animals (criterion #3).